Welcome to the ZapWorks Space Competition. Submit your entry before Wednesday 27th June 2018 for the chance to win $750 and a ZapBox! For the 4th ZapWorks competition, we’re taking AR into space. For this competition, we’re challenging you to build an experience in ZapWorks Studio that incorporates everything we’ve come to know and love about space exploration. 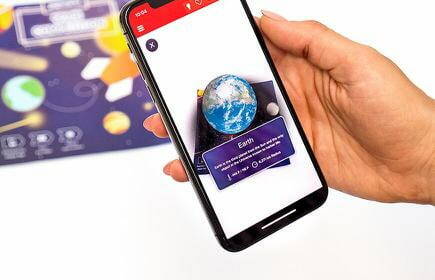 Inspired by the pioneering work of entrepreneurs such as Elon Musk of SpaceX, Richard Branson of Virgin Galactic and Jeff Bezos of Blue Origin, as well as frontier busting government agencies such as NASA and the European Space Agency, we want you to create an AR experience that explores the ethereal and extra-terrestrial. In terms of Studio functionality, we are offering you free reign this time around. Create a winning combination of any of the functionality and techniques we’ve used (and you’ve seen others use) in previous ZapWorks competitions including 360 Gyro, headset mode, masking and 2D and 3D animation. This is also a fantastic opportunity to use functionality you might not have worked on in the past. Why not try to create a holographic message using transparent video? Or learn how to create objects in orbit using bezier curves? Or perhaps you could build an animated little green man character in your favorite 3D software and import it into Studio? Like our theme for this competition, the possibilities are boundless. As well as asking you to build an experience using a space themed environment, we are looking for you to include some additional layers of interactivity and entertainment. Don’t forget to document your progress on the forum, our team and community are always happy to provide assistance and feedback along the way. Most importantly, the team at Zappar hope that this competition allows you to learn something new and as well as enjoy the challenge of building your experience. Good luck! Your entry must fulfill the below entry requirements. Submissions will be judged on the quality of the entry and how skillfully the entrant combines the real world with the space theme to create an immersive experience. The winning entry will be the one that showcases both creative flair and technical skills. Once again, your creations will be judged and critiqued an assortment of Zappar’s in-house team of AR experts. Judges include Lucas Perez, Creative Director, Anna Broadhurst, Lead Designer, & Tom Youel, Senior Creative. The competition is open to all users of ZapWorks. If you’re using a personal account and you’ve already used your free code you will need to purchase an additional zapcode to enter the competition. If you are under the age of 13 please ask your parent or guardian for permission before entering the competition. Your are free to enter as many times as you wish, but please be aware that only one of your entries will be considered for the competition. If you submit more than one experience please specify which experience you’d like to be considered for the competition. The competition is not directed to citizens of countries or states where it's promotion or operation is illegal or unlawful, and such persons are not eligible to enter. Competition entries are void where prohibited by your country of residence. We also reserve the right to disqualify any entrant if we have reasonable grounds to believe the entrant has breached any of these terms & conditions. The competition is not open to Zappar staff, or family members. The winner (1st place) will be selected and announced on Wednesday 4th July 2018 on Zappar’s web properties (www.zappar.com, zap.works, docs.zap.works, my.zap.works & forum.zap.works) , social channels and email newsletter. Winners will, in the first instance, be contacted via email. Complexity - how complex the project is, in terms of scripting, interactivity, etc. Prize winners will be chosen by a panel of judges. In all matters, the decision of the judges will be final and no correspondence or discussion will be entered into. The experience must be your own original work. Entrants are NOT allowed to use 3rd party content without a license. Zappar is not legally responsible for users that submit work without consent from all relevant 3rd parties. You must have obtained any and all consents, approvals or licenses required for you to submit the experience. The experience may not include any third-party trademarks (logos, names) or copyrighted materials (music, images, video, recognizable people) unless you have obtained the explicit permission to use the materials. *Entrants may use the ‘ZapWorks Space Competition - Mini Solar System.ZPP ’ as a starting point for your submission only. To be in with a chance of winning, entrants should add a new mechanic, element or level of functionality to the experience that sets it apart from the original. Zappar cannot accept any responsibility for any damage, loss, injury or disappointment suffered by any entrant entering the competition or as a result of accepting any prize. Zappar is not responsible for any problems or technical malfunction of any telephone network or lines, computer on-line systems, servers, or providers, computer equipment or software, failure of any email or entry to be received on account of technical problems or traffic congestion on the Internet, telephone lines or at any website, or any combination thereof, including any injury or damage to entrant's or any other person's computer or mobile telephone related to or resulting from participation in the competition. Nothing shall exclude Zappar’s liability for death or personal injury as a result of its negligence. By entering the competition, you consent that Zappar may publish you as a winner on the Zappar website(s), Instagram, Facebook, Twitter and LinkedIn.